The traditional agricultural landscape is a multifunctional geographic object, which can provide multiple ecosystem services for human beings due to complex interactions between components, patterns, processes, and dynamics. Taking the Satoyama landscape in Japan and the Hani terrace landscape in southwestern China as objects, this paper reviews and compares their patterns and multiple ecosystem services. The results indicate that both landscapes are composed of similar elements, including forests, villages, wet rice paddies or terraces, grasslands, streams, ponds, and irrigation ditches. However, they differ in distributing area, spatial pattern, ecosystem services, and socio-ecological pressures. The main elements of the traditional Satoyama landscape are secondary forests and small, gently sloping, rice paddies. Its spatial pattern is a heterogeneous mosaic of seminatural ecosystems, and the prevailing ecological process is the flow of organic fertilizer. As the landscape has been abandoned because of various social pressures (the aging farming population, urbanization, and economic globalization), its current ecological service is mainly cultural—providing Japan with a symbol of traditional rural lifestyle. The Hani terraces are still a vigorous, living landscape, which provides all kinds of ecological services for local people and tourists. 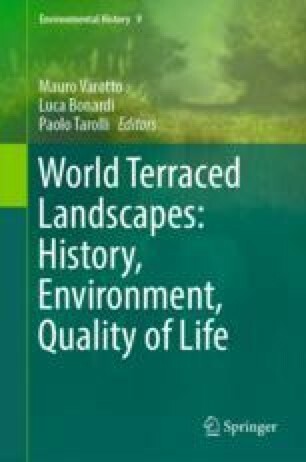 This life in the landscape stems from its reciprocal effects, feedbacks among the vertically ordered components of natural and seminatural forests, villages, and huge, steeply sloping rice terraces. Because they are traditional agricultural landscapes, both the Hani terraces and the Satoyama are facing continuous pressures from social and economic development. Learning the efficient, adaptive management strategies from Satoyama can help Hani rice terraces meet the challenges. This study was funded by the Environment Research and Technology Development Fund (E-0902) of Japan’s Ministry of the Environment, and by the National Natural Science Foundation of China (grant numbers 40401022, 41271203, 41761115). The authors also thank for Anton Pijl and the other anonymous reviewer for their constructive comments, and the editors for their editing of the manuscript.